As Close to Chrome Plating as Paint Can Go! Mission Models has quickly earned an excellent reputation as a producer of uniquely formulated, high-quality acrylic hobby paints. And now, we are proud to introduce a product that is as close to revolutionary as it gets...the most convincing simulation of chrome plating we've ever seen in acrylic paint form! Automotive and aircraft modelers rejoice, because it doesn't get much better (or easier!) than this. In head-to-head testing, this amazing 2-part paint system has beaten every other acrylic and enamel paint product we've ever used to replicate the depth and sparkling gleam of chrome plating, hands down. Best of all, Mission Models does it with a non-toxic, practically odorless, water-based formula that goes on smooth as silk, has shine for days, and cleans up in a snap. How it works: Use your airbrush to apply the gloss black base coat to your project, taking care to lay down a smooth, consistent, even and thorough coating. Let dry. Then airbrush a light and gradual overcoating with the chrome top coat until the desired effect is achieved. Keep in mind, this is one product where the idea of "less is more" actually applies; the gloss black base coat is what provides the perceived depth and reflective quality of the final finish, so you don't want to lay on the chrome coat so heavily as to make it opaque. In our own testing, smaller, more intricate parts, such as model car wheels, tend to yield the most convincing results while larger, flatter surfaces tend to appear less reflective. While you can achieve stunning results on your very first try, we encourage you to experiment on some spare parts to fully understand the capabilities and characteristics of the product and to capture the desired effect every time. To get started, we encourage you to buy both the gloss black base coat and the chrome top coat together (item #87970K). After that, purchase refills separately as needed. Chrome Paint System Set includes one bottle of Gloss Black Base Coat and one bottle of Chrome Top Coat. Each bottle is 1 oz with flip-up dropper top. Mission Models Premium Hobby Paints are the centerpiece of a complete yet simple finishing system. Triple-pigmented for maximum opacity, these high-quality acrylic paints are lightfast and will not fade over time. Paints are provided in 1 oz bottles with convenient dropper tops for easy dispensing. 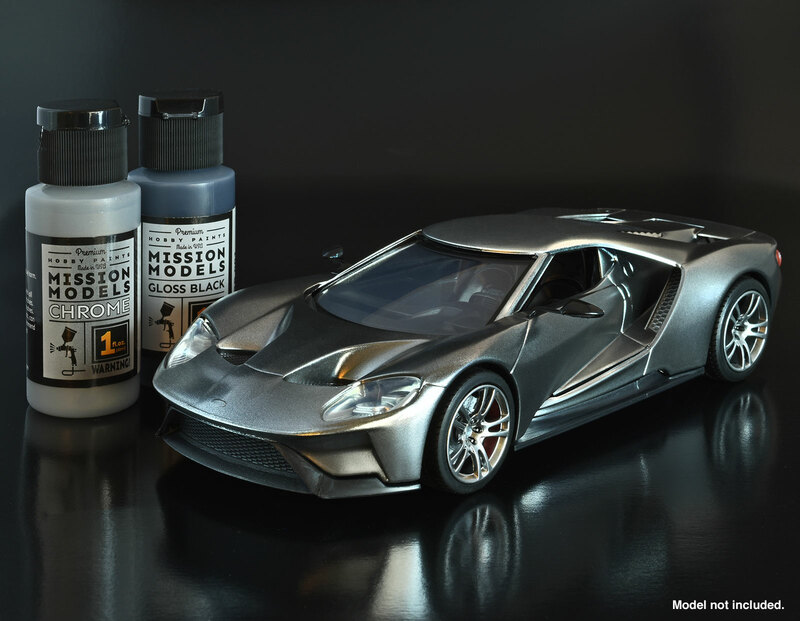 Mission Models' water-based formula does not include any unnecessary additives to create a straight-from-the-bottle, airbrush-ready paint. This means there are no shelf-life issues, premature chemical breakdowns or other disappointing surprises that occur with pre-thinned paints. If you desire an even lighter consistency to your paint, Mission Models Thinner is designed specifically for use with all Mission Models paint products to produce the finest finishes possible. Tested through numerous airbrushes, including the finest tip sizes, we have found Mission Models Hobby Paints to be ideal for scale modelers, figure painters, graphic artists, crafters and all other makers. Although designed primarily for airbrushing, Mission Models Paints are equally suited for brush painting, yielding a smooth, durable, matte finish perfect for a wide variety of applications. Clean-up is a snap with plain water, but Mission Models Thinner is the preferred method for the most thorough cleaning.